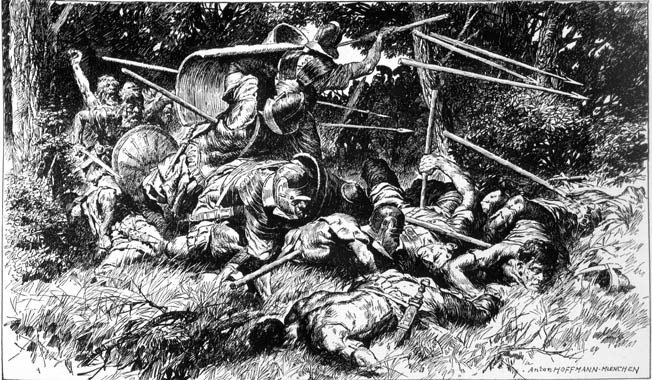 The massacre of three Roman legions by Germans in the Tetoburg Forest in AD 9 ensured that the Romans would not control the lands east of the Rhine. As part of tribal obligations to appease Rome, Segimer, the powerful Cherusci chief, surrendered his sons Arminius and Flavus to the Roman emperor Augustus. The young boys left the village and tribal lands of their birth in central Germania Magna to be taken to Rome. We can only imagine their culture shock. Ripped from a rural life surrounded by wilderness, they found themselves in the greatest metropolis of their age where the streets thronged with people. Such is assumed to be the background of Arminius and Flavus not only because Rome commonly took noble child hostages, but also because of the prominent positions the brothers were to achieve among the Romans. One of them was destined to change the course of history, but not in the way Rome would have foreseen. The two Cherusci brothers were treated as members of the Roman upper class. They were granted the coveted Roman citizenship, tutored in Latin and in Roman methods of warfare. Many years later, in ad 4, the Cherusci gained federated status in the empire. As part of treaty obligations, Rome demanded recruits for auxiliary units. Who better to lead them than the Romanized sons of Segimer? Earning equestrian “knightly” rank, Arminius and his brother served Rome bravely in battle. As part of imperial prince Tiberius’ massive army, the brothers suppressed huge insurrections in Pannonia and Illyricum. Tiberius was finishing off the rebels in ad 8 when Arminius was moved to the headquarters of the Roman governor Publius Quinctilius Varus at Vetera (Xanten) on the west bank of the lower Rhine River. Just under 26 years old, lean and fit, Arminius was in the prime of his life. A contemporary Roman bust shows Arminius with stubble beard and thick, wavy hair that covered his ears and fell to just above his shoulders. From his new posting, Arminius would get a chance to see his family and his homeland again. Vetera was in Germania Inferior, one of the two subdistricts of the Roman province of Gallia Belgica. At the time, Roman presence east of the Rhine, in Germania Magna, was limited to forts and towns concentrated around tributaries giving access into the interior. It was the mission of Varus to turn this semi-pacified area into a full-fledged province. Arminius would not only command Varus’ auxiliaries, but also act as a valuable liaison between Rome and the tribes. Respected by both his countrymen and the Romans, Arminius’ career in the “Roman” Germania was on the rise. It would be hard to imagine two men of more different temperaments than Arminius and Varus. Whereas the first was a natural leader of men, used to hardships of war, life under the sun and stars, the other was a pen- and scroll-pushing bureaucrat without an inkling of the harsh conditions of the northern frontier. Varus received his appointment as governor in ad 7, about a year before Arminius’ arrival. Varus held overall command of no less than five legions and auxiliaries, perhaps a fifth of Rome’s entire frontline strength. 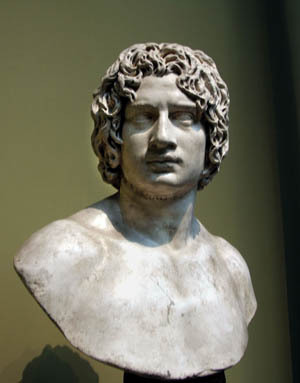 Before obtaining such an important position, the middle-aged Varus, who had marriage ties with the emperor’s extended family, served as consul, as proconsul of Africa, and as governor of Syria. With his command on the Rhine front, Varus was continuing a long legacy of relations between Rome and the Germanic tribes. Although there had been times of peace and trade, there had also been much war. The Romans never forgot the devastating Germanic-Celtic Cimbri, Teutones, and Ambrones invasion of Gaul and Italy at the close of the second century bc, or Caesar’s harrowing mid-century battles with Germanic tribes along Rhine. In 17 bc the Fifth Legion suffered a devastating defeat at the hands of the Sugambri tribe. After that there was continuous strife along the border. “Different peoples at different times would cause a breach, first growing powerful and then being put down, and then revolting again, betraying both the hostages they had given and their pledges of good faith,” wrote Greek historian Strabo. In 12 bc, Drusus, Tiberius’ younger brother, set off to conquer the troublesome Germanic tribes. Roman victory would strengthen the security of Gaul and Italy, provide slaves, and open vast timber reservoirs. Four years of bloody campaigns took Drusus to the Elbe. There a giant woman is said to have appeared, telling Drusus to turn back and warning him of his eminent doom. Drusus died shortly after, either from disease or from falling off his horse. A mournful Tiberius took over, leading the war effort against the German tribes into the early years of the first millennium ad. Nine times Augustus sent Tiberius into Germania, but in the end more was achieved by diplomacy than by the strength of arms. At the time of Varus’ arrival, relations between the tribesmen and the Romans proceeded amiably. The natives bartered milk and cheese, game meat, fowl, cattle, sheep, goats, and hides. In return they received the luxuries of Roman civilization: glassware, silver cups, bronze trays, and more than anything, wine. A Roman town was discovered near modern Waldgermis on the River Lahn. Here a gilded bronze statue of the divine Augustus mounted on a horse served as a reminder of the empire’s omnipotence. Farther west, on the Rhine, at the settlement of the Roman-friendly Ubii tribe, Oppidum Ubiorum (Cologne), a Germanic priest worshipped at Augustus’ altar. The altar looked out toward Germania, where its chieftains likewise honored the emperor. The Germans were being conquered and assimilated into the empire without even realizing it. But, so far, the tribesmen paid no tribute to speak of and retained their uninhibited lifestyle, laws, customs, and weapons. A Roman bust might be Cherusci Chief Arminius, who commanded German auxiliaries attached to Varus’ army. The continued independence of the Germans did not sit well with Varus. If Germania were to be a Roman province, the Germans would have to pay tribute in silver and gold. After all, how could Varus line his own pockets if there were no taxes to be collected? Varus decided to govern Germania as he had done Syria, draining the land of its wealth and maintaining order through brutality. To Varus the Germans were little better than animals, humans in appearance only, to be ordered around like slaves and kept in line with Roman law. Varus held an assembly, boasting that he would control the “savagery of the barbarians with the lashings of the lictor and the voice of the herald,” wrote modern historian Hans Delbrick. Gold and silver were rare in Germania. The common goods and livestock seized as tribute, in lieu of precious metals, further impoverished the already poor tribesmen. Villagers cursed and spat at Roman rule. Chiefs met and reminisced about the freedom too easily given away. The barbarians “sadly watched their swords rusting and their horses unexercised, when they realized that the toga and court were worse than weapons,” wrote Delbrick. Ridding themselves of the Roman presence, however, would be no easy task. Although the Roman outposts were few, they were strongly held. The Germans decided to bide their time and outwardly yield to the demands of Varus. As was common practice, after overwintering on the Rhine, Varus planned to spend the summer of ad 9 at an advance post deep inside the barbarian wilderness. Varus would take with him the Seventeenth, Eighteenth and Nineteenth Legions from Germania Inferior. The First and the Fifth Legions, under the command of Varus’ nephew, Lucius Nonius Asprenas, remained in Germania Superior. From the plateau of Moguntiacum (Mainz), Asprenas kept watch across the river. Asprenas was ready to defend not just the middle Rhine but also the lower Rhine of Germania Inferior, which after Varus’ departure would only be held by a few legionary detachments and auxiliaries. The first shoots of green foliage and a warm wind heralded the end of winter’s cold grasp and the approach of spring. Early in March, at the beginning of the Roman campaigning season, Varus and his army crossed the Rhine over a narrow pontoon bridge. He followed the traditional route into Greater Germania along the Lippe River valley through Sugambri territory. The Roman column stretched mile after mile, shadowed by a small fleet of boats carrying the heavy supplies. After a night in a marching camp, Varus reached Rome’s main base on the Lippe at Aliso. Varus conferred with the Nineteenth Legion’s camp prefect Lucius Caeonius, whose detachment held the fort, reorganizing the forty tones of daily grain and fodder consumed by Varus’ army. From Aliso, Varus struck farther east along the Lippe, pressing onward for two days to the fort at Anreppen. The legions had now marched more than 100 miles since they left Vetera. At Anreppen, Varus left the Lippe and made his way north through the Teutoburg Forest and the western reaches of the Weser Hills. Upon reaching the upper Weser, Varus built his summer camp on the western bank in the middle of Cherusci territory. Varus’ summer camp dwarfed any of the local settlements, the larger of which consisted of some two score houses. The camp housed around 12,000 legionaries as well as three auxiliary alae (cavalry squadrons), and six cohorts of auxiliary light troops. Alongside Arminius’ Cherusci, the auxiliaries likely included strong elements of Rome’s staunch allies, the Ubii and Frisii, and numbered 4,000 men. Attending the soldiers were several thousand servants, not to mention the illegal wives and children of the legionaries. A few hundred of the more adventurous merchants from the Rhine bases also had followed Varus’ army. Varus’ legions were well trained, among the best units in the Roman army. Historian and veteran of the Pannonian and German wars, Roman historian Marcus Velleius Paterculus praised the legions’ “outstanding discipline, courage and combat experience.” First raised in 49 bc, by Julius Caesar during the beginning of the civil war, the Seventeenth, Eighteenth, and Nineteenth Legions consisted of Italians, Gauls, and a few Syrians and North Africans. The Germans had little chance of breaching the ditch and the rampart of the well-defended summer camp, not that Varus ever imagined they would try. After all, Arminius’ family was thoroughly integrated into the Roman military and government. His brother Flavus continued to serve Rome abroad. Their father, Segimer, and his brother, the renowned warlord Inguiomerus, as well as another Cherusci noble, the huge and physically powerful Segestes, were respected allies of Rome. 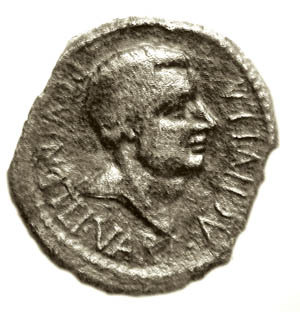 Segestes’ son, Segimundus, even served as a priest at the altar of Augustus in the Ubii capital of Oppidum Ubiorum. Varus’ entourage included nobles from other tribes as well, such as a young Boiocalus from the Ampsivarii. Arminius and Segimer feasted at Varus’ table and assured him that all was well. Cherusci tribesmen came to Varus’ court, asking him to dispense Roman justice on complicated trials and replace might with right. Varus felt as if “he were the city praetor meting out justice in the Forum rather than commanding an army in the middle of Germany,” wrote Paterculus. Believing the land to be at peace, Varus risked splitting the troops, sending them out to deal with petty robbers and to protect and improve the supply route back to Anreppen. Although outwardly Arminius assured Varus of his goodwill, Arminius had come to hate everything Roman. To Rome the German tribes were not equals, as he once thought. Germania’s sons fought and died for Rome while her daughters served the conquerors and her wealth fattened the pockets of men like Varus, who knew nothing of honor and battle. Arminius was not alone. He met with other tribal chiefs to forge plans on how to rid themselves of the Roman despots. When Arminius saw the Romans triumph in Pannonia, he learned of their strengths and their weaknesses. Arminius knew that an assault on Varus’ camp was out of the question. Likewise, when drawn up in battle formation, the legions were near unbreakable. Although, since the days of Caesar, the tribes had become wiser in the ways of war and fielded more and better swords and spears; both in equipment and discipline, the German warrior remained markedly inferior to his Roman counterpart. The bulk of the tribal army consisted of farmers, and many of them could afford little more than wattle shields, woodman’s axes, clubs, and bone-tipped spears. Furthermore, Arminius knew that his warriors remained difficult to control on the battlefield since they were not enlisted soldiers. The Germanic warrior fought purely out of personal choice, for martial glory, for vengeance, to gain loot, or due to social pressure. The only real power that Arminius possessed to make them obey was his personal charisma. Arminius told the assembly that to negate the legions’ superior equipment and training the tribes had to attack under favorable conditions. When strung out on the march, in difficult terrain that favored the quick and nimble, lightly armed Germanic warrior, the legions could go down in defeat. The leaves rustled in a cool wind, heralding the coming of fall. Soon Varus and his legions would return to Vetera on the Rhine for the winter. The time for the Cherusci to strike was drawing near. Arminius’ fiery eyes blazed with passion as the chiefs rattled their weapons in approval. Word about his impending treachery leaked out and reached Varus’ ears. Not all the Cherusci chiefs were ready to abandon their flourishing careers in the Roman Empire, most notably Segestes. Segestes divulged the news about a brewing conspiracy to Varus after a banquet. Segestes urged Varus “to arrest Arminius and the other chiefs, and also himself, on the grounds that their removal would immobilize their accomplices and Varus could then take his time in sorting out the guilty from the innocent, wrote Roman historian Tacitus. Varus had heard it all before. Even though Segestes seemed more anxious than usual, Varus would not listen. Arminius had his eye on Thusnelda, the daughter of Segestes, who, as fate would have it, was betrothed to another. Varus accused Segestes of slander. He likely thought that Segestes was only being a protective father and acting out of his personal dislike of Arminius. Almost immediately after Segestes’ latest accusations against Arminius, Varus received the news that a few distant tribesmen, perhaps the Angrivarii to the northwest, had rebelled. For Varus the timing was less than ideal, for his army was ready to begin its late summer march back to Vetera on the Rhine. Arminius advised Varus that to deal with the rebels, Varus should lead his army back to Vetera on a different route from the usual military road. The detour would take Varus along the northern edge of the Weser Hills and the Teutoburg Forest, where the highlands descended into the swamps and forests of the North European Plain. Varus agreed; his legions would set out at once to crush the insurrection before it could grow any larger. Word was sent to the Roman detachments that were strung out along the supply route back to Anreppen, or were chasing robbers in local villages. The detachments were ordered to catch up with Varus’ slower main column. Arminius and his Cherusci contingent joined the legions marching out of the camp gates. Above each legion bobbed its eagle standard, proudly carried by the first cohort. Wings spread, talons gripping thunderbolts, it was an icon of near religious nature, representing the invincibility of Rome. No doubt the soldiers who marched beneath those proud standards thought that the rebels would easily be dealt with. The legionaries were in good spirits. If things worked out, the legionaries would be back in their secure winter base at Vetera in no time. Their pockets were full too, having just received the third installment of their stipendium, their annual salary, which they could top off with loot and slaves from the rebels. The clatter of armor and iron-nailed sandals resounded through the woods. Arminius and his entourage galloped along the long Roman column. Reigning in his steed at Varus’ position, Arminius exclaimed that he and his men must dally behind. More tribal reinforcements were on the way. Arminius would gather them and then return to Varus. 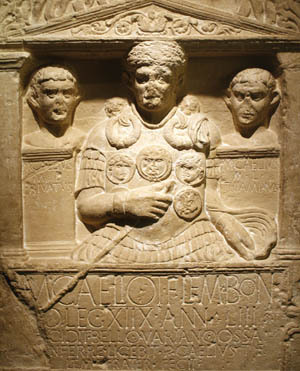 The cenotaph of First Centurion Marcus Caelius of the Eighteenth Legion, who was slain in the Teutoburg Forest. The numbers of the three Roman legions destroyed in the battle were never reallocated. Arminius and his attendants rode off to muster the other Cherusci chiefs. Segestes, however, at first refused to join the rebellion. Hoping to avert disaster at the last minute, Segestes’ men seized Arminius and threw him into chains. The debacle only delayed the inevitable, for Segestes had no support from the other chiefs, who soon freed Arminius. Arminius led an army of between 10,000 and 17,000 warriors back to Varus, and several times as many were still on the way. Word of the impending attack on the Romans continued to spread from one farmstead to the next. Not just among the Cherusci did warriors gather but also from their allies the Marsi and the Bructeri and possibly from the Angrivarii, Chauci, Chatti, and Sugambri as well. Roman patrols and work parties along the route to Anreppen and in the countryside were caught off guard and slaughtered by Cherusci whom they at first thought to be allies. The Ampsivarii noble Boiocalus likewise was taken unawares and imprisoned when he refused to break his Roman allegiance. Out on the farmsteads, the tribal families gathered provisions of millet, barley, and livestock. Priests took sacred emblems from their holy groves and carried them into battle. The Germanic warriors would fight side by side with their family members. Fathers, sons, and brothers were comrades in arms, families were their squadrons and clans were their divisions. Varus’ army made good progress over relatively open country, covering 15 miles before setting up its first marching camp. In the middle of the camp, torches flickered off the silver and golden eagles planted in sacred ground. Early in the morning, trumpets called for the soldiers to wake. By the time they sounded twice more, the packing and loading was completed and the legions stood ready to march. The path to the rebels led through heavy woods. Dark clouds of the northern fall hovered over the horizon. Soon Varus had his hands full just moving his army ahead. Oak and birch, beech and alder, boulders and rocks hemmed in the legions as if the very woods and mountains were turning against the Romans. There were no real roads by Roman standards. Legionary pioneers wiped beads of sweat from their foreheads as they lifted axes to chop trees blown onto the trail, which hindered the passage of the convoy wagons. Above them, tree limbs of giant oaks groaned and leaves rustled in the wind. Rain belted down and somewhere in the distance thunder burst and flashes of lightning cut the sky. Tired feet stumbled over slippery roots. The armor and camp gear carried by each legionarygot heavier and heavier. The officers were luckier; many rode horses and most of their gear was in the baggage train. Wooden wagons slid into swampy pools. Men groaned and whips lashed at sweat-coated mules as both strained to free wheels embedded in mud. Treetops broke and fell upon the Romans. Streams, swollen by the rain, had to be forded. The convoy became more and more stretched out. The legionaries hopelessly intermingled with the accompanying camp followers and with pack animals and the herds of livestock. Everything slowed to a snail’s pace. Whistles cut through the air. Here and there, all along the convoy, javelins and slingshot showered upon the Romans. The wind carried guttural bellows: the barbarians calling upon their spirits and their gods. Ghostly figures, pale-skinned, near-naked bearded giants, appeared and disappeared among the trees. The barbarians, lightly armed, carrying nothingt but large oval shields were at home in the woods. They struck at will wherever the Romans were at their weakest. Overwhelming numbers of Germans would mow down half a dozen legionaries. Before the Romans could gather sufficient reinforcements, the barbarians would flee back into the impenetrable thickets. In their heavy mail or the newer segmented armor, the legionaries were too slow. Slowly, painfully, the Roman convoy dragged itself onward. The barbarian attacks never let up, striking at man, woman and beast alike. The enemy was everywhere, and to the Romans, their numbers seemed without end. Arminius, the other chiefs, and their personal guards, distinguished by mail shirts and iron helmets as befitted their ranks, were likely in the thick of it. Probably Arminius galloped back and forth along the Roman column, directing and partaking in prepared ambushes led by the chiefs. The Romans suffered mounting losses without being able to seriously harm the enemy. The only blessing was that at least the rain stopped for a while. At last, Varus’ battered convoy reached a place to set up camp. Despite the physical strain of the march and fighting, the legionaries’ iron endurance enabled them to dig a deep ditch and pile the excavated soil into a rampart. Many remembered their training days when they cursed at having to carry equipment that was twice as heavy as their regular 70 pounds of armor and gear. Now that training paid off. The two servants that attended to each contubernium of eight legionaries brought up their pack mule to unload the tent and the heavier baggage. Fires sprang up between the ordered rows of thousands of gable-roofed tents. Unfortunately, a lot of oxen, pigs, and sheep had been lost during the harrying attacks of the day. For many legionaries, the only meat to supplement their bread was perhaps a strip of dried bacon. The legionaries huddled around the fires, wrapped in their red military cloaks, the sagum, enjoying a last few swigs of cheap wine. The woolen sagum probably doubled as their blanket. The groans of the heavily wounded broke the still night air. Ordinarily, the skill of Roman medics was such that despite their dangerous profession, Roman soldiers enjoyed a longer life span than their civilian counterparts. In the Teutoburg, though, it was difficult to keep wounds clean and to administer the required aid. Many of the wounded, victims of shock and blood loss, would never awake. Somewhere deep in the forest, the Germanic warriors too took their rest. Their woolen trousers, tunics, and cloaks dried quickly beside smokeless fires. The Germanic women bandaged open wounds and applied healing herbs. They also provided moral support, praising their men who risked their lives for their families and who fought with courage. Alongside their usual porridge of barley and millet, the warriors ate pork and beef, some of the latter having no doubt come from the Roman column. As they wrapped themselves in blankets and furs and drifted into slumber, the Germans too thought of sons, fathers, and friends lost in battle. German tribesmen assault Romans amid the ancient trees of the trackless, rugged terrain. A range of low, forested hills in the German Central Uplands was the scene of the disaster. The next morning, the Romans burned any surplus equipment and most of the wagons. They left behind their heavily wounded, doubtlessly killing many to spare them capture and torture. It would not have taken long for the Romans to identify their attackers of the previous day as Cherusci and Arminius were likely spotted in the fighting. Clearly, the initial news of a rebellion had been a sham meant to lure Varus and his army into the wilderness and disaster. The question for the Romans was how to proceed. The untried routes ahead, to the Ems and to friendly Frisii territory or to the lower Rhine, were far shorter than backtracking to the Lippe road. Their load lightened, the Romans pushed on northwest the next morning. The barbarian attacks continued and their numbers grew. At times the road improved and led through cleared areas of pasture meadows, barley, and wheat fields. Yet even in these open areas the Romans faced ambushes by barbarians hidden in the long grasses. And thereafter the track always led back into the foreboding woods. Roman attempts to lash back at the barbarians in close infantry and cavalry ranks faltered as the trees jumbled up their formations. On the third day the overcast sky erupted anew, drenching the legions. Fortunately for the legionaries they came upon good defensive ground for the next marching camp. They were now skirting the northeasterly to northern side of the 350-foot-high Kalkrieser Berg. The hill protruded from the Wiehengebirge on the northern extremity of the Weser Hills into the Great Moor. Behind the mauled convoy, back along its 20-mile passage to the southeast, lay 13,000 dead that were left as food for flocks of ravens and packs of wolves. The heaviest casualties were among the thousands of servants, slaves, and civilians who would have made the easiest targets. The fatigued legionaries must have been ready to drop, but training and discipline paid off, enabling them to set up a defensive barrier. In his command tent, Varus held council with his remaining senior officers. With two of his legion commanders having fallen in battle, Varus relied on his remaining legate Vala Numonius and his two camp prefects, the third in command of a legion, Ceonius and Lucius Eggius. In the end there remained only one choice. There was no going back and with no supplies they could not hold out. Plunging north or south into the even harsher terrain of the swamp or hills was tantamount to suicide. Perhaps sitting by a fire, Arminius conferred with his chiefs as well. The battle had gone well, the Romans were beaten, and many called for an assault on the camp. Likely against the wishes of Arminius, who characteristically would have seen no point of risking his warriors on a premature attack, the loot-hungry council overruled him. It was likely just before dawn that trumpets blared and Varus’ banner, a large square identifying the commander and his army, was raised to signal the call for battle. From all directions, barbarians charged at the camp, plunging through the shallow ditch and storming the ramparts. Volleys of Roman arrows swooshed into the howling masses but the barbarians came on with a fury. The legionaries were able to fight in formation and defend from above, behind earthen ramparts and walls of sharp stakes. Released of their pent-up frustration, of not being able to come to grips with their foes, the legionaries fought with renewed vigor. The barbarian waves pounded against the Roman shield wall, only to be gutted and stabbed from above by Roman swords. Though swaths of tribesmen lay at their feet, with each assault the Roman lines became thinner until they gave way. The Roman breastwork half torn to pieces, the tribesmen burst into the camp. Wounded in battle, Varus knew the end was near. Shamed by the disaster he had brought upon his legions, Varus chose the honorable death of suicide. In the footsteps of his father who met defeat at Philippi when Varus was but a child, Varus and his highest ranking officers fell on their swords. Word of Varus’ death caused the troops to lose their last hope. A few imitated Varus and took their own lives. Others threw away their arms. The last legionary line protecting Varus’ body collapsed while his men tried to burn his body. Camp prefect Ceonius decided to surrender; he was killed. Legate Vala Numonius, the last legion commander, took command of the Roman cavalry. Vala, otherwise a brave man, decided that his only chance was to abandon the infantry and he vanished with his cavalry into the forests. They were never heard of again. The only one who retained his composure was the remaining camp prefect, Lucius Eggius. Retaining order among his own cohorts, he rallied fleeing legionaries to him. Gathering what provisions they could on mules and taking with them their wives and closest servants, the legionaries of Eggius’ ad-hoc battle group fought their way out. Probably they faced only sporadic opposition as the bulk of the barbarians were busy ransacking the Roman camp. When the spoiling attacks on Eggius’ retreating column abated, his men proceeded in silence. Hoping to elude their pursuers, Eggius’ men even muffled the bells attached to the mule harnesses with tufts of grass and earth. Their hopes were dashed when the way ahead narrowed into a choke point between deep swamp to their right and an earth embankment to their left. A waist-high palisade of stakes, interlaced twigs, and branches ran along the top of the embankment, and behind it lurked more tribesmen. The legionaries locked their shields above their heads in tortoise formation. Under a deluge of missiles, they tried to force the barrier. The wooden mesh bent but did not break easily under the blows of Roman axes and entrenching tools. When the Romans faltered the barbarians sallied forth. Groups of Romans died fighting to the end, including brave Eggius. Others finally panicked, risking all for a mad dash into the swamp. Only a very few lucky legionaries managed to make a desperate escape to the Rhine. A red haze clouded the barbarians’ eyes as they “struck down man and beast,” wrote Roman historian Cassius Dio. Somewhere on the battlefield, out of the hands of the Roman standard bearers slipped the gilded silver or golden eagle standards. Two eagle standards, the physical embodiments of the legions, fell into barbarian hands. One was claimed by the Cherusci, another was taken into the land of the Marsi. The third legionary eagle was broken off its shaft by its bearer, who hid the eagle under his clothing and disappeared into the swamp. The Germans dug up the half-burned body of Varus. One of them walked up to the ghastly blood- and mud-soaked corpse. He lifted his blade and lopped off the head. No doubt a wild cry went up from the bystanders; this was the fate of the Roman “conquerors.” From a platform, Arminius addressed his exuberant warriors, who cheered his mocking of the eagles and the Roman standards. The grim trophy of Varus was eventually sent to Maroboduus, Arminius’ rival and king of the Marcomanni, a sign of the power of Arminius and the Cherusci. The barbarians took cruel vengeance, especially on the leaders, the stripling, thin-stripe tribunes, and the hardened first centurions. “They pierced out the eyes of some and cut off the hands of others. In one case, they cut out the man’s tongue … and the barbarian who held it in his hand shouted at him: ‘Now, snake, your hissing is finished,’” wrote Roman historian Publius Annius Florus. The merciless Germanic gods also demanded their due. Several hundred Roman prisoners were sacrificed, dragged to altars in forest groves. The Romans had their throats slit or they were hanged from trees. Weapons, armor, and ornaments were thrown into sacred ponds. Others were dragged into slavery, a fate the Romans had meted out to so many other people. “Men who might have hoped to enter the Senate someday spent the rest of their lives as shepherds or doorkeepers,” wrote Roman historian Seneca. Amazingly, 40 years after the battle, a few Roman survivors were recovered by allied German tribal levies who intercepted a party of Chatti raiders into Upper Germania. 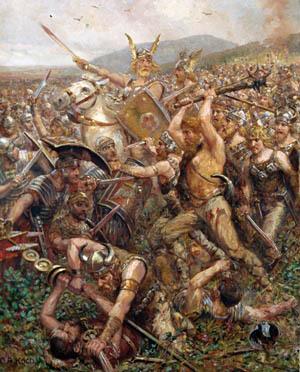 Since ambushes and javelin barrages killed the majority of Romans in the Teutoburg, German casualties probably numbered less than 4,000 killed and wounded. Of the wounded, a few hundred more died days or weeks later from the common battle ailments of tetanus, gangrene bacterium infections and blood poisoning. The bodies of the German dead were placed on funeral pyres alongside their weapons. As flames engulfed the fallen, women wailed in anguish and sorrow while the men held back their tears. The barbarians pressed onward to Aliso on the Lippe. Arminius displayed the heads of slain legionaries in front of the besieged Roman garrison. Camp prefect Lucius Caedicius replied with volleys of Roman arrows that mowed down the assaulting barbarians. Caedicius held the walls until his provisions were used up and most of the tribesmen had moved off. During a stormy night his garrison made its way west, reaching the Rhine but abandoning a large number of civilians. Farther south, on the Lahn, the Romans burned down their town at Waldgermis and fled to the Rhine. On the Rhine, Asprenas’ two legions had their hands full as tribesmen on the river’s west side were causing trouble. At Oppidum Ubiorum, Segestes’ son Segimundus removed his insignia of the Roman priesthood and ran off to join his father, who sided with the rebels. Allegedly, Segimundus even desecrated the corpse of Varus. Everything that had been gained in nearly 30 years of campaigning had been lost in a single battle. The news of the disaster reached Augustus at Rome along with the head of Varus, courtesy of Maroboduus, which the emperor honorably laid to rest in Varus family vault. Augustus disbanded his German bodyguard and sent patrols into the streets to prevent an uprising. He promised the people games in honor of Jupiter, the father of the Roman gods. Tiberius, who had just brought the Illyrian revolt to an end, respectfully postponed his triumph in light of the Varian disaster. German tribesmen overrun a Roman unit. Unlike in Gaul, the lack of large urban centers and good roads in Germany made it difficult for the Romans to subjugate the scattered militaristic population. To maintain stability abroad, Augustus prolonged the terms of the provincial governors. As in the crisis of the Illyrian insurrection, Augustus requisitioned slaves for freedmen cohorts to shore up the Rhine defenses. The freedmen would have to suffice until six additional legions and large numbers of auxiliaries were transferred from the barely ended fighting in Dalmatia. The numbers of the lost legions, the Seventeenth, the Eighteenth, and the Nineteenth, were never reallocated. The defeat in the Teutoburg was unquestionably a major setback for the Roman conquest of Germania, one that became the turning point in the Germanic wars. For months after news of the defeat, the 72-year-old Augustus let his beard and hair go untrimmed. He beat his head on a door and shouted, “Quinctilius Varus, give me back my legions.” The anniversary of the Varian disaster remained a day of mourning. More important, it convinced Augustus to abandon his plan for extending the Roman frontier to the Elbe. Why the change in Augustus’ policy? After all, the Roman Republic had absorbed greater losses against the Cimbri and Teutones and against Hannibal—even though, theoretically, the Republic had a much smaller recruiting base than Augustus’ huge empire. Augustus even retained the state’s right to recruit by compulsion and extended it to the provinces. In reality, however, political considerations likely limited the ability of Augustus to conscript citizen troops. Two new legions were raised, the Twenty-first and the Twenty-second. The Twenty-second was probably made up of Galatian troops, recently granted citizenship. The Twenty-first was made up of the sentina, literally the dregs of the population of the city of Rome, who had never before been a source for the legions. Roman citizens who lived the good life saw no reason to risk life and limb. This was a far cry from Republican days, when serving in the legions was the right and duty of the Roman citizen, and the only recruits normally passed up were the poor. Likely another reason for Augustus’ turn about was that the conquest of Germania was the brainchild of Drusus and not of Augustus. The Varian disaster confirmed that the cost of a German conquest far outweighed the benefits; henceforth, the Rhine was to remain the eastern border. In ad 10 Tiberius returned to the German frontier to carry out some half-hearted raids into Germania. Two years later, when he returned to Rome, Tiberius held his postponed Illyrian triumph. Notably, there was no triumph de Germania. Neither Aliso nor any other Roman presence in the German interior had been restored. In the face of his stepfather’s old age, Tiberius was more worried about ensuring his accession than pressing the conquest of Germania. Others in the upper military echelons thought otherwise. Unlike in Gaul, the lack of large urban centers, poor roads, and hostile terrain nullified any Roman victories because they made it difficult to subjugate the scattered population. All the wars, all the bloodshed, of the last three decades had achieved naught but to further militarize the already dangerous Germanic tribes. Arminius was left free to square off against Maroboduus. Although victorious, Arminius was killed in ad 19 by tribesmen who resented his perceived claim to kingship. Arminius died young but he had already profoundly changed the course of history. His victory in the Teutoburg and his resistance freed the tribes from Roman subjugation and, centuries later, made possible the emergence of Germany, France, and England. Tags Africa, Allies, Arminius, axe, battlefield, cavalry, Cherusci, CIA, Cimbri, civil war, EAM, Emperor Augustus, England, Europe, France, Gaul, German, German tribes, Germania, Germanicus, Germany, Greek, Hannibal, Illyricum, Inguiomerus, Italy, javelin, Julius Caesar, Lae, marching camp, military, north africa, NSA, Odin, OSS, POW, Publius Quinctilius Varus, Raven, Rhine River, Roman, roman empire, roman legion, Roman Republic, roman shield, roman soldier, roman soldiers, roman sword, roman swords, Romans, Rome, SAS, Segestes, Sling, spear, Squad, sword, swords, Syria, Tern, Teutones, the civil war, Thor, Tiberius, Tory, Troy, US Army, waves, weapons, West Bank, WIN, wounded. In 1942, Evans Carlson’s ‘Marine Raiders’ gained instant celebrity status as America’s first Special Operations team. At the Battle of Ball’s Bluff, Colonel Eppa Hunton successfully rallied his command and played a key role in routing the Yankees.